The berries from the Farmer’s Market- blueberries for pancakes and muffins and the huge black ones like jewels and the strawberries and raspberries… some for preserves. Juicy peach. Cherries from Chelan. Or the brief sour ones. Melons. Zucchini and eggplant and basil right off the plants in your DIL’s garden. The sweet corn from the farm stand. Just back from Columbus OH and missing the family so Steve and I drove to the retro theatre the Oaks in Oakmont– my favorite movie theatre in the area with spacious leg room and a big screen. We saw the documentary Buck (stunning photography of the west) and afterward we got ice cream cones (this is a single!) at Brr-Kees Homemade Ice Cream Stand, smooth and creamy and delicious. 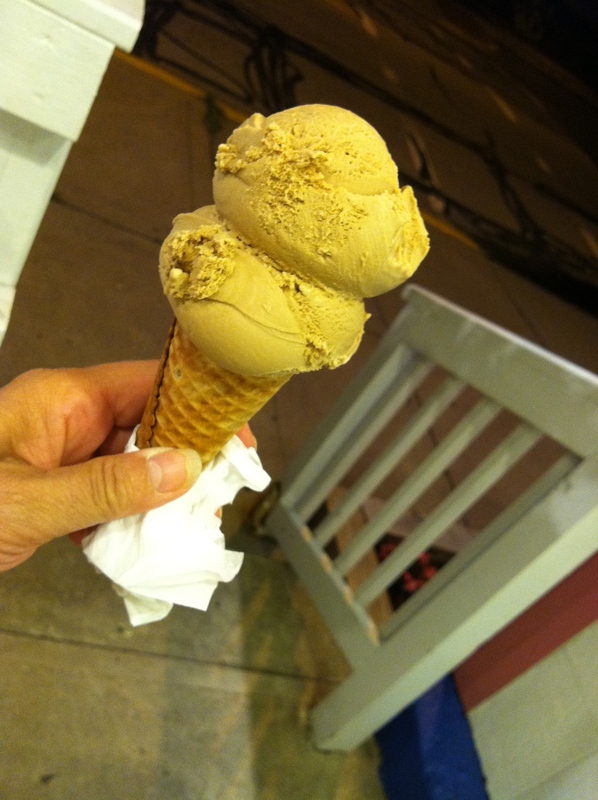 My summer flavor is coffee ice cream. Shot with the phone. Extended the feeling of summer vacation and I didn’t think about the start of the new school year in 3 days time. A generous single scoop of coffee ice cream!